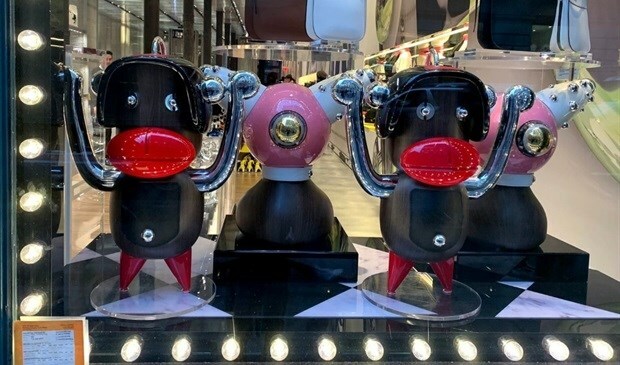 NEWSWATCH: Luxury fashion label Prada has been lambasted for selling monkey-like figurines with overly large red lips in a style reminiscent of racist caricatures of black people. The $550 keychains, on display at a Soho boutique in New York, was noticed by human rights lawyer, Chinyere Ezie, who subsequently took to Facebook and Twitter slating the fashion house for its racist tropes. The display included one style that recalled a Golliwog, the 19th-century blackface character with big round eyes and large red lips. It also resembled the title character from Little Black Sambo, a children's book of the same era. According to an AFP report, the problematic custom of blackface dates back to about 1830 and so-called "minstrel shows," when white performers caked their faces in greasepaint or shoe polish and drew on exaggerated lips in a caricature of blacks. The high-end Italian brand had been using the image on items such as keychains and corresponding marketing as part of its Pradamagalia collection, reports AdAge. After criticism from the public, the Prada Group issued a public apology, dismantled the display and announced that it would recall the offending charm from circulation. The Group responded to backlash saying: "the Pradamalia are fantasy charms composed of elements of the Prada oeuvre. They are imaginary creatures not intended to have any reference to the real world and certainly not blackface." "The Group never had the intention of offending anyone and we abhor all forms of racism and racist imagery." The company has since publicly pledged to improve its diversity training, and announced the formation of an advisory council to guide efforts on diversity, inclusion and culture. Prada also said it would donate any proceeds from Pradamalia already sold to a New York-based organisation committed to fighting racial justice, "which is a value that we strongly believe in".